DAY 62 of SP… On days of muted overcast it’s time to explore.. Morning explores found me The Hatch Mill, I was so intrigued by this building that I found a documentary online that talks of it, A student’s documentary that later won many awards and launched him into his profession of documentary film producer.. It’s well done and can be found at http://www.youtube.com/watch?feature=player_embedded&v=eXjPSfQDf7Q#!.. It looks like the mill was being restored for awhile but once again forgotten.. I think the person spear-heading the restoration may have died for there is a memorial nearby. Sad to see someone’s dream not complete.. 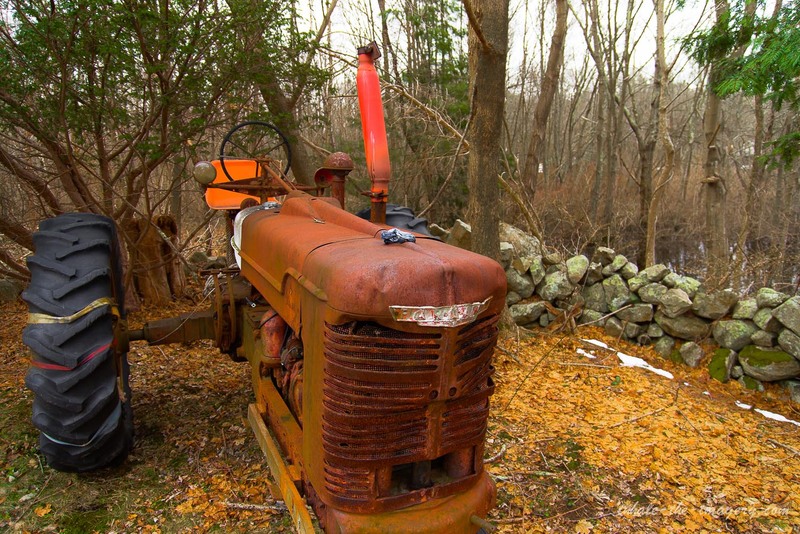 I hope the he knows people still visit; I know because I was one of them this morning… The photo is of another persons unfinished project.. A tractor that was once used as a farmer’s companion, later put to pasture only to be renovated to a degree and put out once again.. It rests at the corner of a meets-&-bounds.. forgotten. The sun is rising to the left of the tractor if one could see through the clouds… a great day for learning more history.